Well, it’s a beautiful day here in DC. I’ve finished up at the local farmer’s market with my friend Jess and now I’m taking advantage of the weather by doing some Breast Care for Washington work out on my porch. Turns out we are in desperate need of a patio umbrella and we get direct bake-you-to-a-crisp sun for many hours in the afternoon. Should be great for our container garden that is behind me in this picture. Not so great for getting my creative writing juice flowing. New apartment, new learning opportunity. 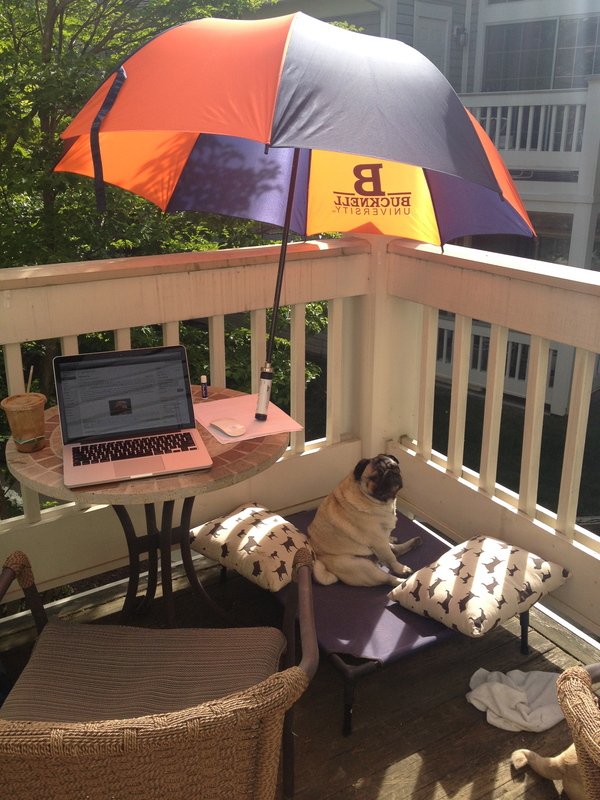 All is not lost: I ended up getting creative with my own version of a patio umbrella, and I have my assistants, Otis (featured below) and Emma to help me. You’ll notice PUGTATO got a design makeover this past week too. (View on your computer to see its fully beauty, it still looks the same in mobile.) Hope everyone is having a great weekend and stay tuned for some really exciting BCW updates coming soon!!! < Previous A lesson in personal branding: hiding online is no longer an option. Next > Watch out, breast cancer. We’re coming for you.